Barbara’s gestural style developed over years of painting and drawing in many genres including landscape, buildings and figure. Pure abstraction has now become her main focus and it is this process of gestural expression moving towards pure abstraction that Barbara brings to IMA this year. Join us at the Island Mountain Arts Gallery for Barb's Opening. Snacks, refreshments, fine art and lovely company provided. The exhibition runs from May 19 - June 12. Life is a flow of changing actors. Isn't it wonderful that Art is the spirit which provides the landmarks in this sea of change? …. My time is finite, and despite good intentions there remains an unpredictable fragility. Painting is something one can do into one’s nineties but as I age, and I am now almost 77, the people who remember my beginning are dropping away. It is to benefit from their collective memory that I am prepared to go onstage and exhibit now. As a young woman in the mid 1950s, Barbara Wilson studied painting under Harry Wohlfarth at the Banff School of Fine Arts, where she was introduced to both abstract and realistic art. Since that time her painting has alternated between the two. Her work is influenced by academic training in physics, math and architecture as much as by her passion for dance and new classical music. She favours high-velocity line that sometimes tapers to the thin, dry-brush finish seen in cursive Oriental calligraphy. Coming from Nowhere is not a retrospective, but an opportunity to see Wilson’s current work set against the backdrop of a small selection of her past work. 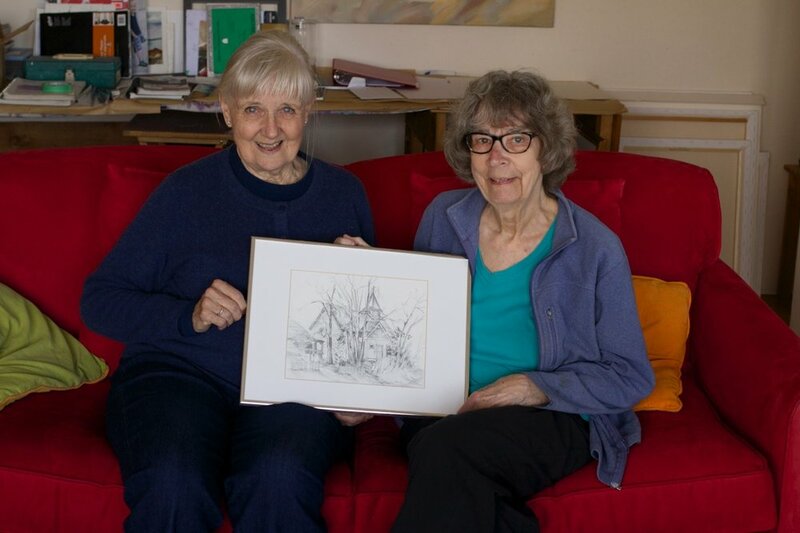 Barbara Wilson and painter, Marie Nagel (formerly of Wells) in Victoria with one of Barb's drawings. Wilson’s work on exhibit here at the Island Mountain Gallery explores movement with the sureness of touch achieved over a lifetime, but with a new intensity. Since 2012, Wilson’s practice is to meditate until no preconceived forms remain in her mind, and only then touch the canvas. Paintings happen very fast, and it’s not possible to go back and fix anything. Action paintings? Abstract expressionism? These are labels. The body’s history of dance, its sheer kinesthetic knowledge, is concentrated into the movement of one hand. Gestures layer over each other, sometimes achieving tremendous depth. Reflecting on over 60 years of art practice she muses: "A painting is really nothing at all. My work has sat in the rain, been tacked to the outside walls of my Kootenay cabin, and once in the 1970s was gloriously peed on by dogs when I put paintings out in the street in early spring as a public celebration of work done over the winter. Now I choose to give the work value, to accept that I might have a place in the world of the public gallery. Now I put the work out as a personal history writ large, deriving from a myriad wonderful personal connections and coincidences."